Snippets of Jack: "This is Jack Sparrow's doing!" 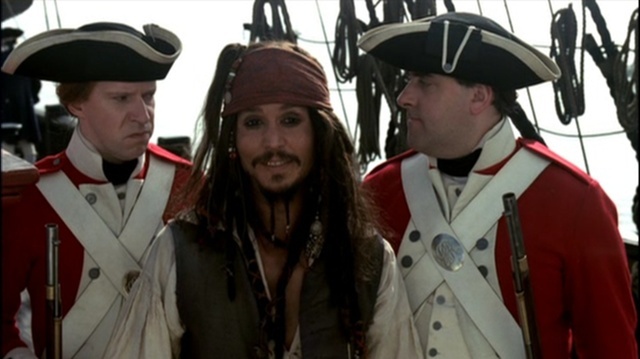 "This is Jack Sparrow's doing!" Guys, I was feeling very ambitious and motivated and felt that I needed to write another post today. We returning to the first (and at least in my case, favorite) movie: The Pirates of the Caribbean: Curse of the Black Pearl. I thought we should focus on the couple that never actually happened: Elizabeth Swanna and James Norrington. Norrington finds and saves Elizabeth from a desserted island that Barbossa left her on. Elizabeth: "But we've got to save Will!" Governor: "No. You're safe now. We will return to Port Royal immediately, not gallivanting after pirates." Elizabeth: "Then we condemn him to death." Governor: "The boy's fate is regrettable, but so is his decision to engage in piracy." Elizabeth: "To rescue me! To prevent anything from happening ot me!" Jack: "If I may be so bold as to interject my professional opinion. The Pearl was listing after the battle. It's unlikely she'll be able make good time. Think about it. The Black Pearl, the last real pirate threat in the Caribbean, mate. How can you pass that up, eh?" Ohhh, appealing to his sense of pride and hatred towards the pirates who captured his dear Elizabeth to begin with. James: "By remembering that I serve others, not only myself." Well, Elizabeth seems to be begging you to take him, so I guess he would be serving her to take her to the Pearl. Elizabeth: "Commondore, I beg you, please do this. For me. As a wedding gift." That was a plot twist. She's marrying one man who she doesn't like to get him to save another man who she does like. She is abusing James' love to her and using it for her own selfish wants. This shocks even Weatherby Swann: "Elizabeth? Are you accepting the commodore's proposal?" Elizabeth then tries to make herself look all innocent and in love, when we all know it's a lie. Elizabeth: "I am." Jack: "A wedding. I love weddings! Drinks all around!" As you can imagine, everyone gives him an annoyed look, while we are all laughing. Jack gets the message and holds up his bound hands. Jack: "I know. 'Clap him in irons' right?" James: "Mr. Sparrow, (captain!) you will accompany these fine men to the helm and provide us with a bearing to Isla de Muerta. You will then spend the rest of the voyage contemplating all meanings of the phrse 'silent as the grave'. Do I amke myself clear?" Oh James, always so kind and chariming. Jack: "Inescapably clear." Murtog and Mulroy then grab him sharply and shove him along immediately. James reminds me of a poor little girl who gets used by some jerkish older guy, who is Elizabeth. He gives her want he wants just so that she loves him, even though he knows this love is fake. Pretty darn sad. Come on James, grow a back bone! Stand up for yourself! I'm not saying that he should have just left Will to die in the hands of Barbossa at the Isla de Muerta, but he shouldn't have gotten his hopes up with Elizabeth, becuase in the end she just let him down. But he does anyway. The sail to the Isla de Muerta and make it just in the nick of time, because like Jack said, the Bearl was still recovering from its battle against the HMS Interceptor. Norrington, Jack, and his men sail out for a better look at the place in the long boats. Norrington: "I don't care for the situation. Any attempt to storm the caves could turn into an ambush." Jack: "Not if you're the one doing the ambusing. I go in and convince Barbossa to send his men out with their little boats, you and your mates return to the Dauntless and blast them with your little cannons. What do you have to lose?" James: "Nothing I'd lament being rid of." Meaning, he'd gladly sacrafice Jack in tricking the pirates to come out. Jack: "To be quite honest with you, there's still a risk to those aboard the Dauntless, which include the future Mrs. Commodore." This makes James think, and in the end agrees to it. Two soldiers push and pull Elizabeth to the Captain's cabin to keep her safe. Groves: "Sorry, but it's for your own safety." Elizabeth: "The commore, there's something I have to tell him! The pirates, they're cursed! They can't be killed!" It's funny because it's true, and Jack probably made it a point not to revealt his. Groves shoves her in anyway. Groves: "Don't worry, miss. He's informed of that. A mermaid flopped up on deck and told him the whole story." It's funny becaue Groves eventually does witness mermaids, with Barbossa. Elizabeth figures it out. Elizabeth: "THIS IS JACK SPARROW'S DOING!" Jack's just that good, what can you say?